When we look back at the history of our hotels, we have seen a lot of faces come and go over the years. The good thing is that most old crew members still feel comfortable enough to drop by and say hi. And the others? ….well, the others have never left! Outside of the hotel owners (who have obviously been here since the beginning), Phil is now officially the longest working V-crew member that we have ever had. 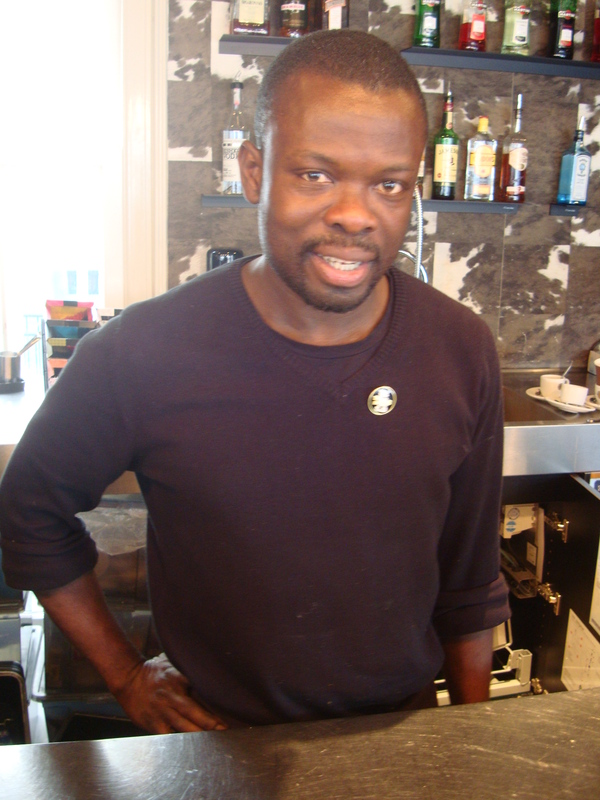 Phil came to the Netherlands from Ghana and joined the V team in 2001, and next month marks the 14th anniversary of his time at V. In those 14 years, he has held various positions in the hotel, and is now the bar manager and the smiling face that greets you every morning at breakfast at hotel V frederiksplein. 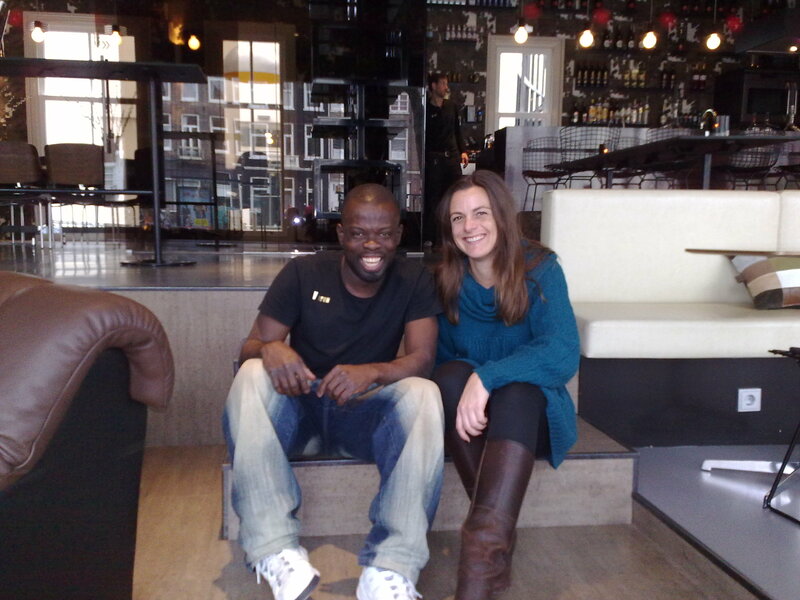 Here we interview him to ask about where he’s from, why he came, and his long history with V.
Why did you come to the Netherlands from Ghana? Did you know anyone here before you arrived? I came for greener pastures. My uncle was here, so I at least knew him. So you landed in the Netherlands- what was your first reaction? Actually I landed in Paris. There’s a story here. Before I left Ghana, I looked at a map, and it seemed that Paris was close to Amsterdam. So I used the last of my money on a flight to Paris. When I arrived, I called my uncle to come and pick me up. I thought it was a lot closer. Because of his job and the distance, he couldn’t come and I didn’t have any money to travel. Disaster! I just didn’t understand the distances in Europe and had misjudged. I went to the information desk, and asked about all the ways to get to Amsterdam. There were 3 options: a flight, a train, or a bus. I figured out the price for each, and the train was the cheapest. So then I had to beg people for the money. Yes. But luckily, one person gave me the full amount. 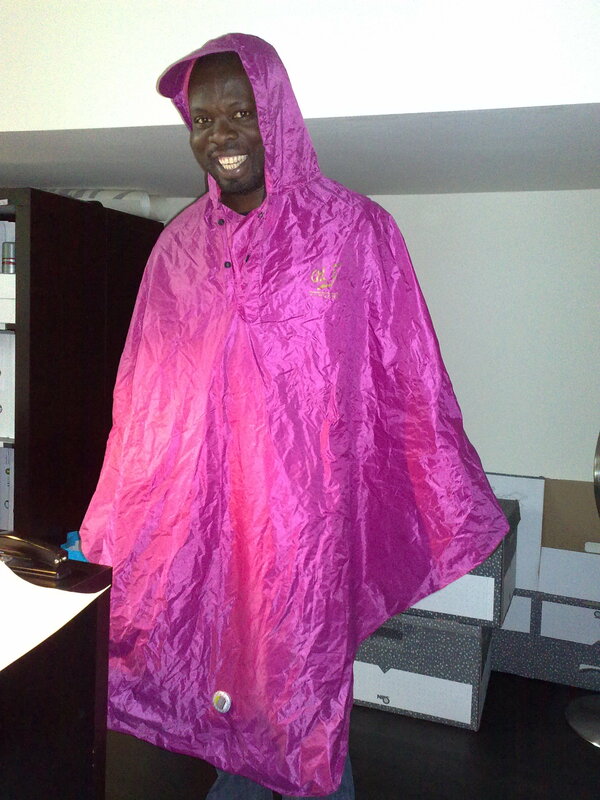 Proof #1 that Phil is embracing Dutch life: He isn’t scared of the rain. So, after a rocky start, you finally made it to the Netherlands. What was the first thing you noticed? The trams! I was waiting for my uncle to pick me up at Central Station, and tram 13 passed. I thought, “Huh? What’s this?” Then we had to take tram 13 to his house, and I thought, “Oh my god, this is so cool”. 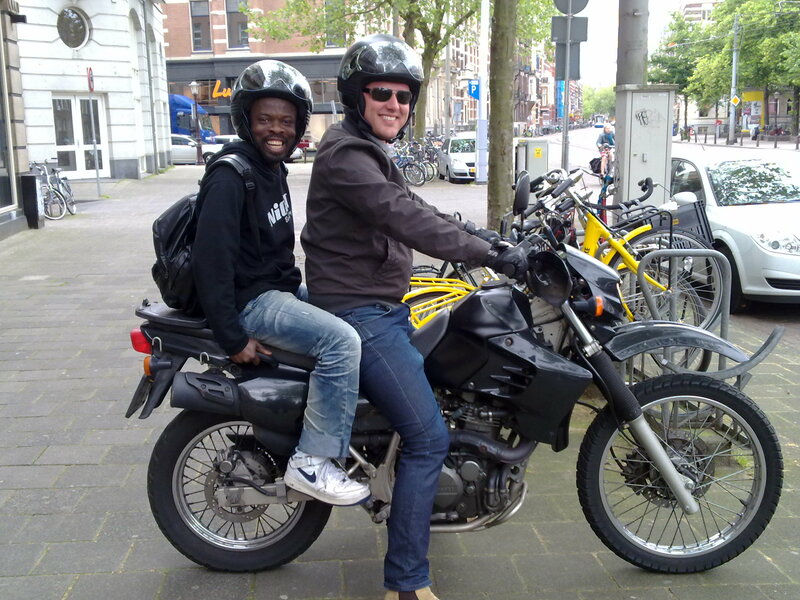 Our General Manager Jan Stuurman giving Phil his very first motorcycle ride. Haha, that’s cute. So in these 14 years, you have gained Dutch citizenship. What’s the best thing about being Dutch? I feel like the door to the whole world is open. Before, if I wanted to go to London, I had to answer about 100 questions for the visa and they still rejected me because of my Ghanese passport. Now that I am Dutch with a Dutch passport, they just stamp it and tell me “Enjoy your stay, sir.” No other questions! It’s so easy! 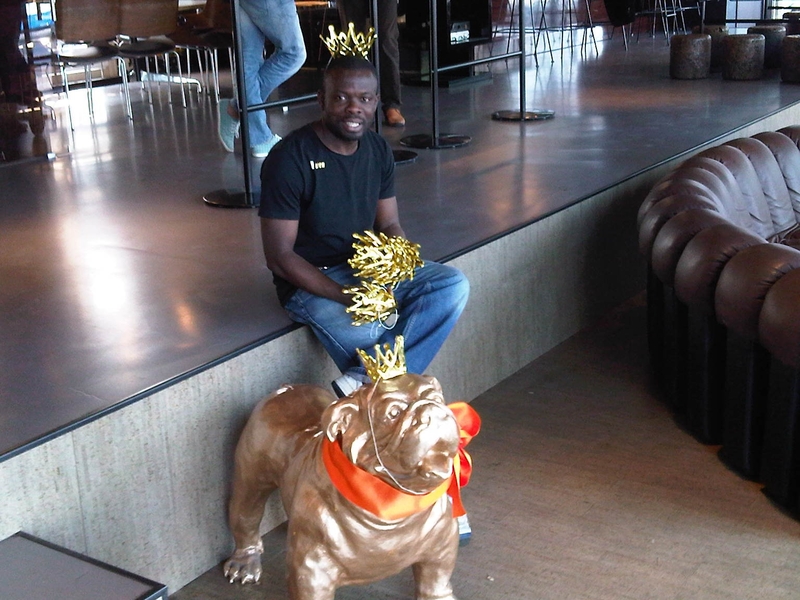 Proof #2 that Phil is embracing Dutch life: He LOVES King’s Day. That’s great! And you are father to 2 little girls that were born in the Netherlands (5 years and 3.5 years old). What’s it like raising Dutch kids? It’s great. But challenging. 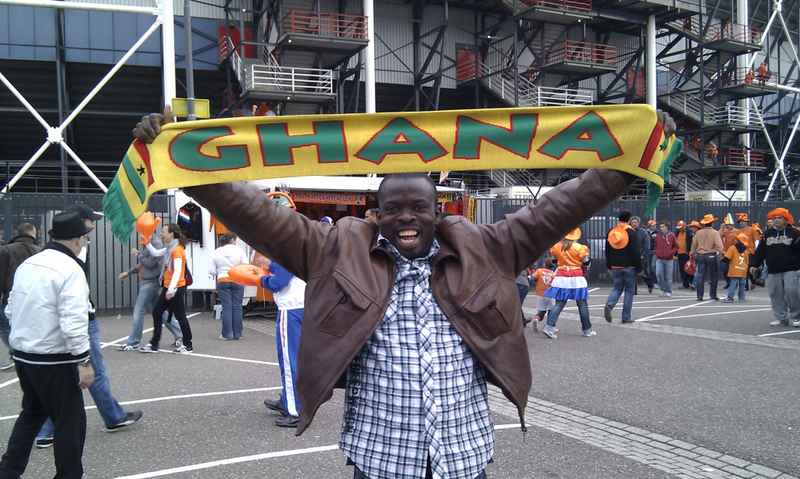 They have a Dutch mentality, and I still have a Ghana mentality, so it can be very confusing but also a lot of fun. And is there anything that you miss about Ghana? My friends from high school and college. We were really close. 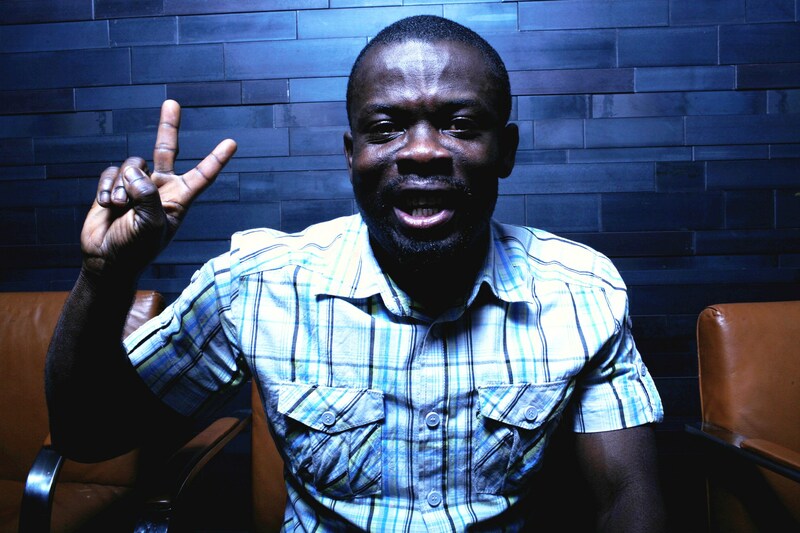 But of course Ghana is always close to his heart. And now about the hotel- you’ve held a few positions in the hotel, but you have now been the bar manager at Hotel V Frederiksplein for nearly 4 years. What’s the best part of that job? When I get a positive reaction from guests. Like when they come up after breakfast and say that they loved it- I get a really good feeling from that. Using Dutch. Especially when I have to make calls to suppliers. I’m okay up to a certain point, but then it’s hard to continue in Dutch. And in all 14 years that you have been a V crew member, how has the hotel changed? It’s changed a lot because of course it is bigger (2 new hotels have been built since I started). There is more staff, more selection at breakfast, things like that. But it still has the same V vibe. It’s a friendly, hard working team that works well together. That hasn’t changed. Thanks for the many years of hard work Phil! Here’s to many more!